Murren is a charming village with magnificent views and no traffic noise. It is perched on a shelf of Alpine pasture forming a balcony overlooking the steep cleft of the Lauterbrunnen Valley. Destinations like Murren are hard to find – alpine scenery, mountain culture, and exciting activities! It is a great place for hiking enthusiasts who wish to enjoy the natural beauty of Switzerland. And in winter you will find skiing for all levels. Murren is the highest altitude ski resort in the Bernese Oberland and faces a series of giant peaks carved out of rock or ice: from left to right the view encompasses the Eiger, the Monch, the Jungfrau, the Breithorn and the Gspaltenhorn range. Book your Murren, Switzerland vacation to experience one of the most beautiful places in Switzerland! This beautiful village is completely cut off from car traffic, and the sporting character account for the popularity of the resort. Being car free will make for an exceptional vacation that will create long lasting memories. From Murren a cable car takes its breathtaking ride up to the Mt. Schilthorn summit. From up there you can enjoy exceptional panoramic views and sip cocktails in the revolving Piz Gloria summit restaurant. Mt. Schilthorn was featured in the James Bond film "On Her Majesty's Secret Service" and is also referred to as the James Bond Mountain. The development of tourism in the area was largely due to the British, who came here at the turn of the century to indulge in their favorite winter sports and who succeeded in recreating a cozy, congenial atmosphere that reminded them of England. It was Murren that the Kandahar Ski Club was founded in 1924; it was to lead to the famous Arlberg-Kandahar competition, which is now regarded as the unofficial world championship of the Alpine countries. Murren is an ideal place for travelers that wish to enjoy the natural beauties of Switzerland. It is a unique village on a sunny terrace, a hiker’s paradise and great for winter sports. We are presenting you just a few of the many activities that are possible on your vacation to Murren, Switzerland and its surroundings. Half or full day excursion up to the 2,970m/9744ft high mountain. Among the most spectacular 360° panorama in the Alps! Wine-and-dine in the world's first revolving restaurant at an altitude of almost 3000 meters. Impressive views embrace some 200 snow-capped peaks, ranging from the Bernese Alps to Mont Blanc in France and Germany's Black Forest making this one of Switzerland's most beautiful places. 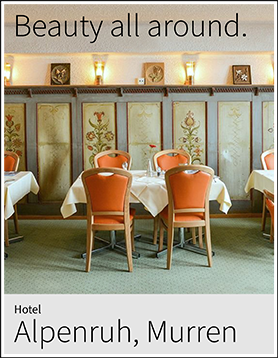 Guests at the Hotel Alpenruh have the option to eat breakfast at the revolving restaurant. Full day excursion up to the Top of Europe at 3454m/11333ft elevation. Snow and ice 100% guaranteed! The Sphinx observation hall, impressive Ice Palace and hiking plateau - these are the year-round attractions up on the Jungfrau Joch, the highest railway station in Europe. Summer attractions include a ski lift, husky-drawn sledging and adventure activities. From May until September you can take the cozy historic cogwheel railway to this superb vantage point. The views of the Eiger, Monch & Jungfrau are acclaimed as the finest. Other attractions include extensive hiking trails, the Lowa Hiking Shoe Test Centre and, especially for our little ones, a large Teddy Bear exhibition. Interlaken is situated between Lake Thun and Lake Brienz. It is the gateway to the Bernese Oberland and a bustling little town which lives of the services it provides to tourists. It is the starting point for many winter and summer activities and 1 hour away from Murren. 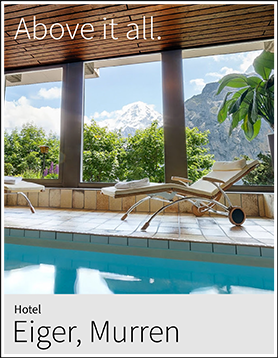 Form the center of town at Hohenweg you will have great views of Eiger, Monch and Jungfrau. Beautiful Bern, the Swiss Capital is only 2 hours away from Murren. This is a city of medieval magic, listed by UNESCO as a World Cultural Heritage. Attractions include the famous clock tower, the new bear park which is home to Berne's heraldic animals – and excellent shopping arcades. Murren is among the best-hiking destinations in the Alps. On a Murren, Switzerland vacation you will find many beautiful hikes and all are well signposted. You will also find park benches along the path which invite to rest and smell the roses. Murren and its hiking path are surrounded by bell-ringing cows, waterfalls and wildflowers and also a great spot. Themed walks such as the North Face Trail, providing historical mountaineering information, and the Flower Panorama Trail invite to discover the region. In Murren you can choose from three ski areas: Murren-Schilthorn is the closest, and Kleine Scheidegg-Mannlichen and Grindelwald-First are on the other side of the valley. In total, you will find more than 45 cable cars and lifts and approx. 220km of downhill ski slopes. The ski area of Murren includes 53 km of ski and snowboarding runs. The resorts are among the most beautiful places in Switzerland to ride the slopes. Visitors to Murren will also find sledging trains and cross-country skiing. For hiking maps and ski and snowboard trains please visit the official website of the Murren Tourist Office. The Mini Museum are a window exhibition in Murren. Walk through the village and learn more by passing the Mini Museum windows. Murren is located in Central Switzerland in the Bernese Oberland. It is 66km/41 miles from Berne and 12km/8 miles from Interlaken. Interlaken is 1 hour by train and to Berne it takes 2 hours. Contact our Murren, Switzerland Vacation Guides today by visiting our Switzerland Trip Planner!